A treasure house of martial arts technique, history, and scholarship, Shihan Rudy Crosswell is considered to be one of the world's greatest living martial arts masters. 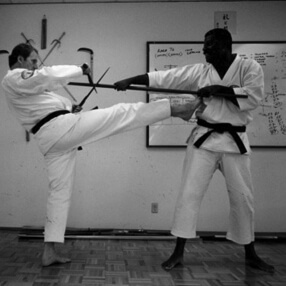 Shihan Rudy Crosswell began his martial arts training just outside of New York City at the age of thirteen. The year was 1960, and his first dojo offered the arts of Isshin-ryu karate and Judo. 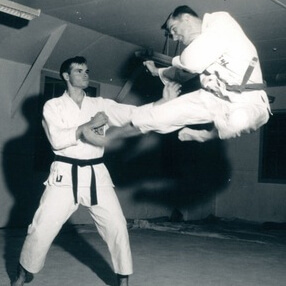 He went on to study Shotokan and Chito-ryu karate during this period before joining the US Air Force in 1965. During his first three years with the US military, he studied Shorin-ryu, Tangsoo-do and Goju-ryu karate. Shihan Crosswell was awarded his first black belt in the art of Goju-ryu karate in 1967, having already embarked on what was to become a lifetime of dedication to traditional martial arts. 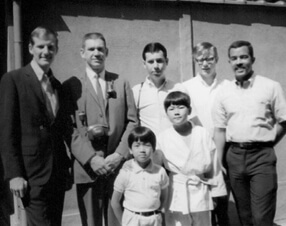 In 1968, destiny favored Shihan Crosswell with a rare wartime assignment to the US Air Force base in Fuchu, Japan. While living just outside Tokyo, he met and became a student of the legendary Soke Shogo Kuniba (Kokuba) and Soke Teruo Hayashi. Though not accustomed to having foreign students, these two master instructors generously provided their eager American protégé with detailed and extensive knowledge of Motobu-ha Shito-ryu karate and Okinawan weapons (kobudo). Driven to assimilate as much martial arts knowledge and skill as possible before leaving the country, Shihan Crosswell spent hours training nearly every day, chauffeuring his Japanese sensei around town, sleeping on dojo floors, and commuting tirelessly between Tokyo and Osaka to soak up every piece of information from them that he could—both in and out of the dojo. 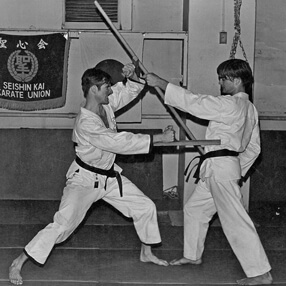 The year 1968 also marked Shihan Crosswell’s first introduction to Japanese sword, and he began his training in the art of Iaido while stationed there as well. During his years overseas, Shihan Crosswell not only studied day and night from these renowned martial arts masters, but also found the time and energy to run the Seishin-kai Motobu-ha organization’s only American branch dojo. In 1969, he and his all-American GI team shocked the nation by taking third place in kumite at the All-Japan Seishin-kai National Championships—shattering the stereotype that only Japanese nationals were truly capable of mastering the art of traditional karate. It was to be one of many outstanding accomplishments that would make Shihan Crosswell instrumental in elevating the status of foreign-born traditional martial artists, both in Japan and around the world. After several years of intense study and training, Shihan Crosswell was finally ordered to return to the United States in 1971. In honor of his achievements in Japan, Shogo Kuniba awarded him a 4th dan ranking and Sensei certificate in Motobu-ha Shito-ryu karate as well as a 1st dan ranking in kobudo. Undeterred by the frigid winters and conservative rural culture, Shihan Crosswell promptly set up a traditional martial arts dojo in the unlikely town of Minot, North Dakota, where he had been sent to complete his military career. 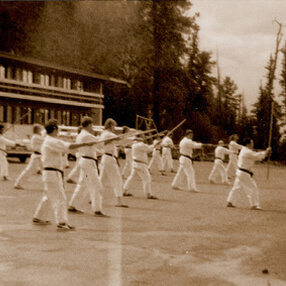 In addition to teaching dozens of students there—including Steven Banchick, now a notable Uechi-ryu master—he served as an assistant professor at Minot State University, teaching the history of karate and Japanese bushido to students and faculty alike. Never pausing in his own intense training, Shihan Crosswell was also recognized as state kata champion during his first years back in the States. In 1973, Shihan Crosswell completed his military duty and moved to Phoenix, Arizona, where he founded the Arizona Budokan. Hungry for ongoing guidance from his beloved sensei, he promptly formed the United States Shito-ryu Karate Association and arranged for Soke Teruo Hayashi to visit and tour the member dojos in America each year. 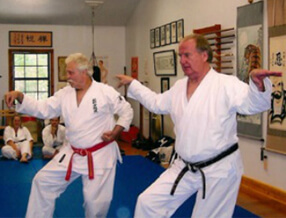 In addition to Soke Hayashi’s annual visits—which often involved dozens of hours of marathon one-on-one training with his loyal American student, Soke honored Shihan Crosswell with special training in both Shito-ryu karate and kobudo during his several trips back to Japan. In 1980, Shihan Crosswell again challenged the previously unquestioned supremacy of Japanese martial artists by taking his Arizona Budokan team to Japan to compete in the World Hayashi-ha Championships that year. 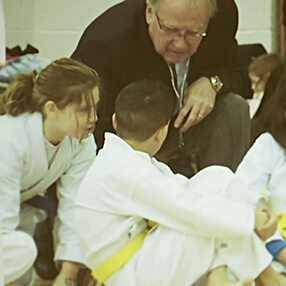 His small group of Arizona kids and adults garnered numerous awards in kata, kumite, and kobudo events, with one of his brown belt students beating out a sea of young Japanese black belts to win first place in junior kata competition. Once again, this American-born traditional martial artist had made a powerful statement. In 1985, Soke Teruo Hayashi awarded Rudy Crosswell the title of Shihan, or master-level instructor, along with a 6th dan ranking in Hayashi-ha Shito-ryu karate. Two years later, the legendary kobudo master celebrated Shihan Crosswell’s achievements in Okinawan weapons by granting him an unprecedented 4th dan ranking in Kenshin-ryu kobudo—the highest rank that Soke had ever bestowed in the art. Never content to rest on his accomplishments, Shihan Crosswell continued to share and expand his far-reaching martial arts knowledge during this period. 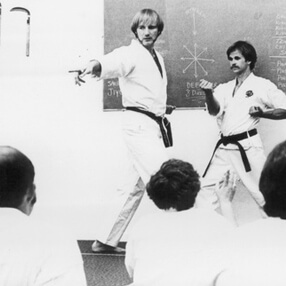 He began by co-founding the US Kobudo Association along with the celebrated martial arts historian and master kobudo practitioner John Sells in 1989, launching into a period of extensive research into the obscure origins of both karate and kobudo. It was also in the mid-80s that that Shihan Crosswell began learning the Jikiden Eishin-ryu style of Iaido under Meijin Katsuo Yamaguchi, a legendary swordsmaster recognized as a Living Treasure by the government of Japan. 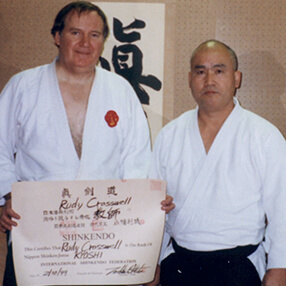 In 1992, Shihan Crosswell was awarded a 6th dan ranking in kobudo from the renowned Okinawan master Yuichi Kuda. 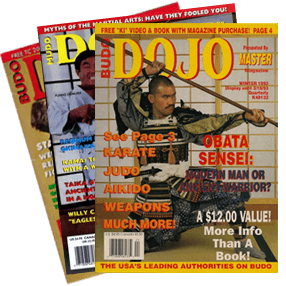 In an effort to further publicize traditional budo arts, he became a primary contributor and editor-in-chief of Budo Dojo magazine that same year. The new magazine catered to a world now hungry for reliable information on authentic martial arts, and reached a wide multinational audience during its highly successful run. It was during this same period that Shihan Crosswell began to train with Toshishiro Obata in the study of traditional Japanese swordsmanship (Batto-do) as well as deadly aiki-jitsu grappling and pressure point techniques. Obata later awarded him the distinguished teaching rank of Kyoshi, as well as the highly advanced practitioner rank of Tokui, in the art of Shinkendo. It was also in 1992 that Shihan Crosswell was first introduced to Kenzo Mabuni, the second son of the founder of Shito-ryu. Shortly thereafter, Shihan Crosswell began to host and train with Soke Mabuni on regular visits to the US, efforts that led to a 7th dan rank in Seito Shito-ryu as well as a Shihan certificate and membership in the exclusive Seito Shito-ryu Shihan-kai. Shihan Crosswell continued to train with Kenzo Mabuni through 1996. As always, he continued to actively expand his now formidable kobudo syllabus, training closely with such prominent kobudo maters as Masahiro Nakamoto and Fumio Demura. As he entered his fifth consecutive decade of unbroken martial arts training, the world began to take notice of the vast amounts of knowledge, experience, and skill that Shihan Crosswell had accumulated over the years. The International Seibukan Martial Arts Association, headquartered in Kyoto, Japan, recognized his contributions to both the art of Shito-ryu karate and Okinawan kobudo by awarding him the ultimate rank of 10th dan, Hanshi, in Shito-ryu Karate and 9th dan, Kyoshi, in Okinawan kobudo. It was a spectacular achievement for any martial artist, but it was truly unprecedented for this American instructor to finally be given his place in the history of Japanese martial arts by such a highly respected and staunchly traditional budo organization. The Seibukan went even further, however, granting Shihan Crosswell an 8th dan rank in Hakutsuru-ryu (White Crane) karate in 2002 for his years of dedication to the style—hoping that he might join other foreign-born masters in preserving this precious and rapidly fading piece of Japan’s martial arts history. 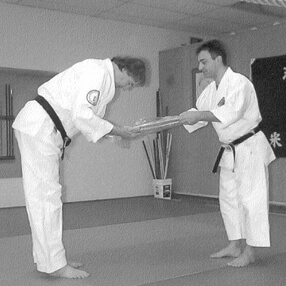 Shihan Crosswell was selected for the honor not only for his deep knowledge of the performance and application of Hakutsuru forms and techniques, but also for his extensive research on how the style had influenced the development of Shito-ryu karate and many other martial arts styles. To add further dignity to this rare achievement, his rank was enthusiastically endorsed by the renowned Meitoku Yagi, a legend of Okinawan Goju-ryu karate. In light of his far-reaching accomplishments in the art of Okinawan kobudo, Shihan Crosswell was finally promoted to the rank of 10th dan, Hanshi in the art by Hanshi George Alexander, Director of the International Shorin-ryu Karate Kobudo Federation, in 2007. This honor came on the heels of an article in the UK's Traditional Karate magazine that heralded Shihan Crosswell as "the most knowledgeable weapons master in the USA". By now highly sought-after as one of the world’s premier traditional martial arts experts, Shihan Crosswell taught throughout the United States as well as in Europe, South America, and Asia-headlining seminars and workshops around the globe. Still, amidst his worldwide popularity and hectic schedule, Shihan Crosswell continued to run the headquarters of the International Shito-ryu Karate Federation and the International Kobudo Association through the Arizona Budokan, patiently handing down his tremendous store of knowledge to the students in his home dojo. 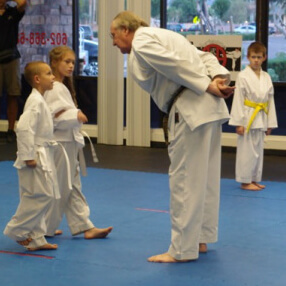 At a time in his career when many other high-ranking martial artists are content to sit back and take a passive approach to their own training, Shihan Crosswell never stopped actively seeking out new karate, kobudo, and sword information-all the while devoting his heart and soul to nurturing individual students at the Arizona Budokan. Shihan Crosswell is a top-ranking instructor in three separate styles of Shito-ryu karate: Motobu-ha, Hayashi-ha and Seito. As a result of his expansive, in-depth knowledge of the myriad aspects of this complex art, he is able to offer the students of the International Shito-ryu Karate Federation and its Arizona Budokan headquarters a broad and detailed Shito-ryu syllabus that is unparalleled anywhere in the world. Thousands of serious students of the Shito-ryu style and karate in general have attended his informative classes and seminars in hopes of gaining even a piece of this priceless knowledge—some of which is available from no other living instructor today. 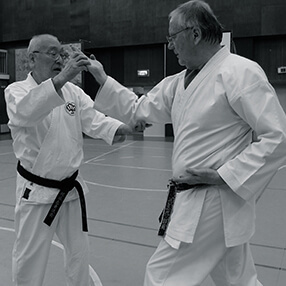 Perhaps even more extraordinary is the level of kobudo knowledge that Shihan Crosswell has managed to accumulate in his fifty-plus years of passionate and tireless dedication to these nearly lost arts. 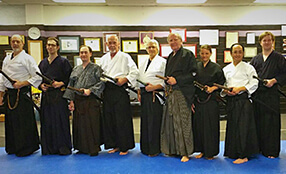 Master of more than a dozen weapons within several styles of Okinawan kobudo, Shihan Crosswell is not only a world-class technician, historian, and collector of weapons kata, he is also an outstanding weapons combatant and swordsman as well. Adamant about retaining the history and detailed nuances of every individual style and form that he teaches, Shihan Crosswell never homogenizes the variants of his karate or kobudo forms, but presents them each to his students with their unique features and priceless lineage intact. For the serious martial artist and true budo practitioner, there is no better way to encounter the authentic power of these precious and increasingly rare arts. 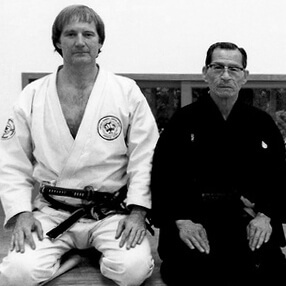 In sum, it is the exceptional history, outstanding talent, and lifetime commitment of this gifted and devoted master that make the Arizona Budokan one of the most unique and extraordinary places to train on earth.